Welcome to Episode #27 of the Living Homegrown Podcast! 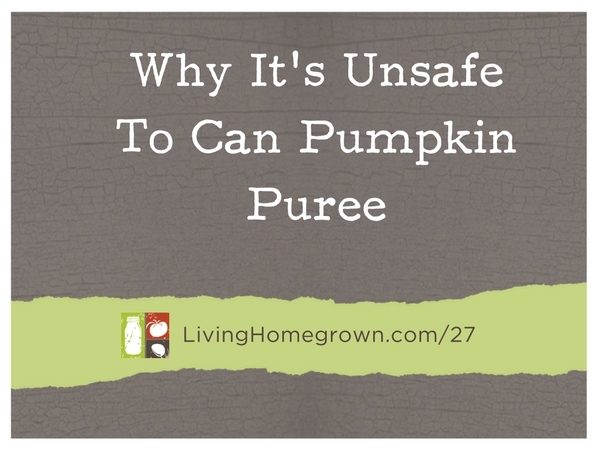 Listener Debbie has noticed there are many heated debates in online forums about whether or not it’s safe to can pumpkin puree or pumpkin butter. She asked me to give my take on the subject. So I recorded a podcast episode to answer this question – but I think I approach this topic a little differently than most. I not only cover the USDA recommendations but the big WHY behind those recommendations from a scientific AND a gardener’s perspective. Choose dual purpose jars that are made for both canning and freezing. It will say so on the box and/or will have “freeze line” (or similar wording) stamped on jar. Do not use old mayo or spaghetti sauce jars. They are not tempered for freezing. The “headspace” is the air space from the food to the top rim of the jar. It allows for the expansion of the food during the freezing process. Straight-sided jars should be your first choice because they are less likely to crack due to pressure on the neck of the jar when the food expands. How to Freeze Produce in Canning Jars – This video focuses on how to freeze garden produce, but the jar recommendations still apply. Leave me a message over on my Ask Theresa Page – It’s easy!